any companies offer aluminum gate and fence products. Why don’t we? TEK Gates and Fences has been working with steel for the past 12 years and we continue to be impressed by its strength and longevity. While aluminum has become popular for gates and fences due to its corrosion resistance and weight, steel is a stronger alternative. With a Hot Dipped Galvanized undercoat and a baked on Powder Coat finish, a steel gate or fence will maintain it structural integrity and outlast an aluminum gate or fence. Our Gates are Powder Coated and Strong ! During the Hot Dip Galvanizing process, the gate or fence is dipped in multiple solutions including a molten zinc solution that covers the inside and outside of the steel tubes. This 12-step process prevents the gate from rusting from the inside out. We do not paint on our galvanizing. TEK Gates & Fences are not only hot dipped galvanized, but are also finished with a TIGER Drylac Powder Coating. The powder coat is applied with an electrostatic spray gun then melted and chemically cross-linked at substrate temperatures of between 180 and 200 degrees celsius. The resulting coat finish is smooth and durable, the same as powder coatings used in the automobile, construction and architectural industries. Our powder coatings are environmentally friendly because they are solvent free, unlike liquid coatings and do not pollute the air, soil or groundwater! Steel is a stronger alternative to aluminum. It is heavier and resists impact. The weight of the gate can generally be managed by two people. Most of the installations were done by two people without machinery. Check out our installation videos and watchour gate being installed. THAT'S WHY NO ALUMINUM GATES OR FENCES ! 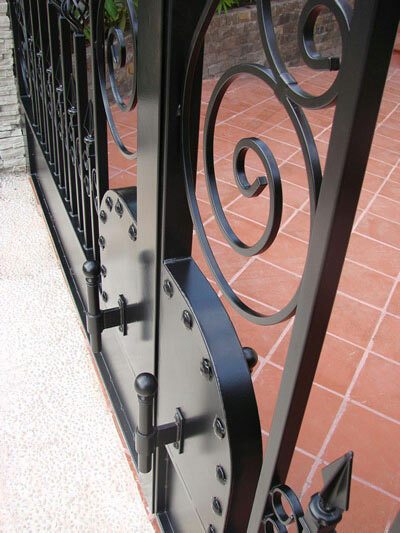 A steel gate is managed easily by the selection of openers we offer. Most professional openers feature a soft start and stop and are designed to handle the weight of a gate. If you already own a lesser rated opener that requires a lighter gate, you might want to consider aluminum. Our gates and fence will not sag underweight or stress. This allows for longer fence panels and thus fewer post holes which means less labor on a fence installation and wider, stronger gate leaves. Shipping costs for aluminum are typically cheaper since the fence or gates will weigh less. So if shipping costs are your primary concern, aluminum may be a better choice. Please be sure to compare all the extras (such as bringing the gate to your site, and not just to the shipping terminal for you to pick up) included in your shipping costs from other gate companies, as these can add up. We don’t charge you any more than the shipping company and we get a significant discount for you. An aluminum gate or fence does fare well in wet conditions for a certain amount of time. 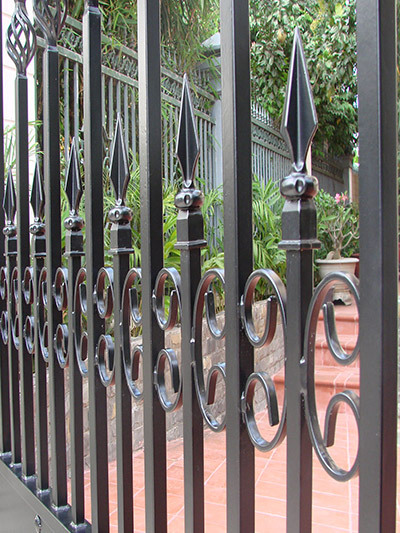 If you do choose aluminum be sure that it is protected with a powder coat finish so your gates or fence do not lose their finish and eventually corrode. Rust-oleum paint is often recommended to maintain the gate’s finish — it is a good idea to do this frequently with Aluminum gates that are not protected by a powder coat finish. If your primary concern is corrosion resistance, we suggest you use steel with a Hot Dipped Galvanized undercoat and a powder coated finish which will outlast aluminum and paint and look much better for much longer.